This stations data is collected by a Davis Vantage Pro2 Professional Weather station with a 24-hour fan-aspirated radiation shield. This shield combines fan aspiration and passive shielding to minimize the effects of solar radiation on temperature readings. In addition to the temperature sensor this station has an anemometer, automatic rain gauge, humidity sensor, barometer, and solar sensor. The readings from the solar sensor in combination with other sensors allow us to calculate evapotranspiration. Evapotranspiration (ET) is a term describing the transport of water into the atmosphere from surfaces, including soil (soil evaporation), and from vegetation (transpiration). This is useful in determining how much water is needed for irrigation. A 4 inch manual rain gauge is also part of this station and is used to report rain fall totals for a 24 hour period to CoCoRaHs. The sensors for this station are situated as optimally as possible for the highest accuracy with the temperature-humidity sensor 5 feet above mown grass and the anemometer approximately 25 feet above ground in a relatively clear area. The data from this station is quality checked by the Citizen Weather Observer Program (CWOP). This is done by comparing our readings to a predicted value based upon an analysis of data from other local weather stations. The results of that analysis can be seen here. Data from this station is uploaded to a dedicated weather computer every 1.5 seconds. The data is collected and displayed using the software Weather Display. Weather Display then uploads that data to LorisWeather.com with the current conditions updating every 5 seconds. This station is fully automated and operates 24 hours a day every day. There may be times the station is down for maintenance or technical problems but we will try to keep these as short as possible and it will be noted on the website. LorisWeather.com is a non-commercial, not-for-profit, privately owned and operated weather station and weather information web site. It was created to provide residents and visitors of the Loris area with live local weather observations, weather forecast, warnings and advisories specific to the area. 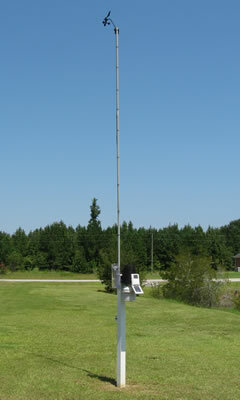 This weather station is located within the city limits of Loris and offers the most accurate and up to date weather conditions for the area. The web site LorisWeather.com came online May 11, 2011. The weather station powering this site came online in April 2007 and began uploading data to Weather Underground. This historical data can be seen here. Data from this station is also shared with The CWOP (Citizens Weather Observer Program), Weather for You, CoCoRaHs (Community Collaborative Rain Hail an Snow Network) and The Southeastern Weather Network. In addition to the NWS forecasts, local weather forecasts are generated for LorisWeather.com using Wxsim software. Wxsim is interactive local atmospheric forecast modeling software that uses data from the National Weather Service as well as data from this station to create forecasts specific to the Loris area. Special thanks go to Benton Henry of Benton Henry Photography for the use of the sunset banner graphic and the Loris clock picture. The upper reaches of Horry County were settled mostly by second and third generation Scots, whose families had settled in the Cape Fear region of North Carolina. Because there was no natural or geographical barrier between the provinces (later states) people moved back and forth without hindrance. The name of the town of Loris is said to have originated with the Chadbourn’s, though members of that family have offered different versions of how it came about. Since both stories originate from the same source and from the same period, it is impossible to know the truth of either. Loris will probably always have to live with the uncertainty of whether it was named for a novel or a canine pet. For whatever consolation it may be, the name is at least unique among place names in the United States. There were little settlements in every direction around Loris which had grown up around mills, gins, or turpentine stills Generally there would be a small general merchandise store which was frequently a commissary supplies by one of he larger turpentine firms. Daisy, Bayboro, and Green Sea were among those which held as much promise as Loris in early days. 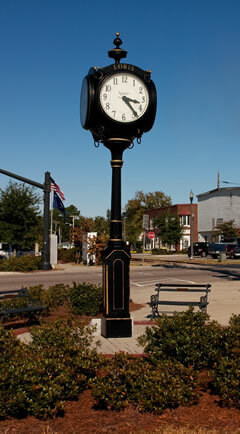 Bayboro, for example, was on the railroad at that time and had five stores in 1899; Gurley, also on the railroad, had four stores, two turpentine stills, two churches, and a schoolhouse in 1900. In 1901 Daisy had three stores, a post office, a cotton gin, grits, and saw mills. Its newspaper correspondent bragged it had tri-weekly mail and telephone lines. In the 1930's the paving of Highway 9 put Loris on the state map by funneling beach traffic through Main Street. When a dual lane by-pass was constructed in 1984-1985, traffic to the beaches went around the town. The net result of that will probably not be fully realized for years. At the same time the phenomenal growth which has characterized the Grand Strand has begun to push outward along the Highway 9 corridor toward Loris, accelerated in recent months by plans for extending water and sewer lines along the highway. Loris is set for another period of expansion.